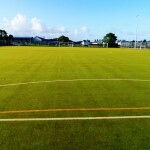 2G sand dressed sports pitches are a popular surfacing option for a number of sports facilities across the UK, but the sand dressed specification is best suited to hockey. 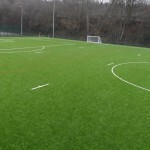 When you choose to install a 2G artificial grass sports surface, we can tailor a sand dressed specification to suit your budget and requirements in terms of dimensions and the sports you want to play. The first part of the sand dressed surfacing designs is the sub base; the turf carpet must be installed onto a sub base as this provides even foundations and ensures top performance characteristics. A shockpad can also be installed beneath the sand dressed synthetic grass to enhance safety, provide impact absorption and protect players’ joints and muscles to reduce the risk of injury. The sand dressed artificial turf carpet is installed onto the sub base and has a layer of sand infill applied within the turf fibres, this infill helps to stabilise the turf and provide even playing characteristics for hockey, football and tennis. The shorter 22-24mm pile height of the sand dressed specification creates excellent ball roll capabilities and meets the FIH accreditations for hockey. You can have a range of equipment and extras included within the designs for sand dressed surfaces; the costs for these can vary in price depending on sand dressed specification and area size. 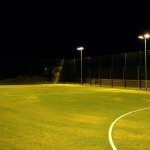 Some of these extras include inlaid line marking in different colours for a number of sports, fencing in a range of heights from 3m-5m, floodlights and maintenance equipment. We can offer a number of different sand dressed surfacing designs to suit different budgets and requirements to ensure you get the best sports facility for your organisation. You have full control over the sand dressed specification of your 2G sports pitch and you have the freedom to choose from a wide range of variables, so it’s important to consider all the options you have available when deciding on a budget for a sand dressed surfacing project. These 2G sand dressed synthetic sports surfaces are durable and hard wearing, but it’s still important to carry out regular maintenance to keep the sand dressed specification as good as possible and prevent any damage. This maintenance could include brushing and cleaning to remove debris and contaminants, or sand infill rejuvenation which involves extracting the dirty sand and replacing it with a new layer of infill to improve the performance and safety qualities of the sports facility. Putting a regular maintenance plan in place for your sand dressed synthetic pitch will extend its life expectancy and ensure you have a top quality sports surface which can be enjoyed by everyone.